...violà! 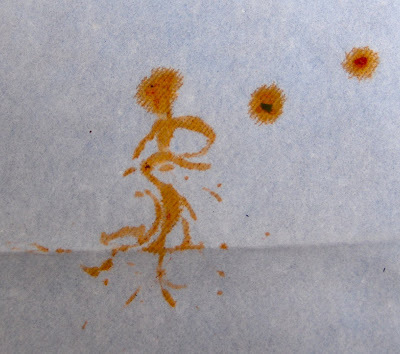 The Latina Spaghetti Dancer was fortuitously born! "Things that Amuse Me" or "My Tribute to a Pre-Halloween Abbotsford Psycho-Type Moment"
Filmmaker/Videographer I'm not... but I can only imagine if I had iMovie (and of course some skill) ... then I might really astound my mammoth audience. One if by Land, Two if by Sea 36"x15"
Bouquet of White Flowers 24"x24"
My sister and I exist in extreme polar lives... She as wife, at home with husband and 5 kids, me as artist, roaming about the planet, child-free. 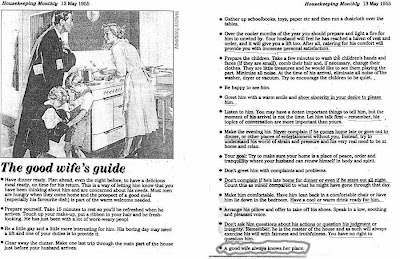 Actual 1955 Good Housekeeping article. What is so funny about this? I do this every day for my sweet endearing darling. When he comes home I am so gay (third bullet point) that he just feels gay himself. I am just quiet and let him tell me all about his travels and exquisite 5 star restaurant gourmet dishes while I have been happily feeding 5 children frozen dinners and gaily, continually tidying the house so that I can make a nice trail to walk through. I minimize all noise by taping my children’s mouths shut as I comb through their knotted hair and wash their faces before he arrives. Oh, but the bliss continues as I cater to him by propping up his favourite pillow behind his tired, weary head and offer to take off his shoes from a long trip. I smile as I get a cold beer from the fridge for him. Lastly, I make sure I have put deodorant on and touch up my hair and make-up from a long day of children pulling, screaming, and joyful demands that never cease. My husband looks to me to satisfy every personal need and I am there to provide it. I am woman, joyful friend, cook, and confidant. I do not have any needs and have been programmed by society to be a robot with no emotions or feelings. It is so wonderful and I love life as I am cheerfully wound up for a new glorious day that awaits! ... and I mean "the path" literally as well as inspirationally. You want a view? Here, you gotta earn it baby! No elevators, seniors' scooters, escalators or any other type of "UP" methods of human body transport, just what you've got on you. Just so you know, you've it good - by this first photo, we are now half way there to more inspiration. This journey starts from just outside Susie's front door on Via San Francesco in Vernazza - she lives up a good few "stories" by this point. her studio is in the former church which is also Vernazza's city hall now - the bells still echo thru the hills on the hour and half hour, the new church is down in the village in Piazza Marconi. Her studio space is in the former priest's residence before the church was converted into what it is today. she's got a lot of free reign around here... they like her! just in case you need a rest, I haven't included yet another flight of stairs in this foto journey... you can thank me later. yep... go up more stairs. Sepia tones can take you back in time. Never seen the sea so black as it was this day - it was the morn after a big thunder and lightening storm. Another work space outdoors high up on the church "catwalk"... that sounds rather ironic! Jake's "running room" on a rainy day (part of the outside area of her studio) - I had to catch him running... he's so sweet! ready to start new pieces... at the moment, most of her work is at her exhibition in Genova. Good exercise, beautiful view, gorgeous paintings - and also lovin' that floor of hers - refreshed my inspiration once again! Well, for those of you who know me, I love fishing and all things about the sea. So, this blog is for all of you who enjoy similar things, or just simply looking at photos! Sun coming up in Amalfi streets. On the way to the fish market store from Amalfi. Yes, this is a 2-way street... the MAIN street. Part of the main 'drag'. Short wee video clip... camera battery SOooo close to dying and I am SOooo not done yet! Arrived at shop... the guys, checkin' out today's catch. Deep plates of local fish. "i Dentici"... yep, they got teeth. Totani (Squid)... these are little guys - you should see the big ones! Looking out from the fish shop - lots of lovely Amalfi lemon trees! To the left (not in photo) is the Mediterranean Sea. Just outside cafe, hop in car and head to the left, back to the Fiord restaurant. Espresso with a side of water - I'm much slower at drinking it than the Italians! ...but I arrived safe and sound from fun little adventure!